"He Who has a hue that is attractive like gold". Thus, the literalmeaning of the nAma is "He Who is golden-hued". Gold is known for its purity and its untarnished nature, its effulgence, itsbeing highly desired by people, etc. His Illuminating Power, His Purifying Nature, His being desired and coveted byall His devotees, etc. The term suvarNa here stands for "that which is extremely desiredand longed for, that which is flawless and pure", etc. 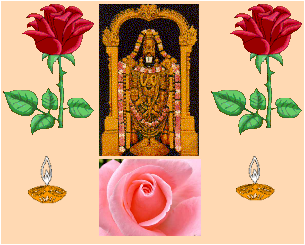 SrI aNNan'ngarAcArya gives the explanation: "He Who has the divya svarUpamwhich is blemishless like gold". nAma-s similar to the current one are used in the outpourings of AzhvArs whogrope for words to describe the aunbhavam that they have had of theindescribable emperumAn. SrI v.v. rAmAnujan gives several examples fromprabandham. "inbap-pAvinai, paccait tEnai, paim-ponnai, amarar Sennit pUvinai". - nammAzhvAr describes Him in tiruviruttam (85) as "ualgu aLanda mANikkamE!En maradagamE! MaRRu oppArai illA Anip ponnE!" - The Gem that measured thethree worlds! My favorite Emerald! The Incomparable Pure Gold! (in tretAyugam), Your hue is golden, and (in dvApara yugam), Your hue is blue..
"When the seer sees the purusha, the golden-hued, creator, lord...". and perceptible by the intellect only when in a state of abstraction". - Aditya varNam (purusha sUktam 20) - He Who has the luster of the sun. golden altogether to the very tip of His nails". and attains the supreme State of Equipois". PirATTi is also described along the same lines in the veda-s: "hiraNyavarNAm hariNIm..." (SrI sUktam). kaccin-na tad-hema samAna varNam..." (sundara. 36.28). 744. hemA'ngah - He of golden-hued limbs. SuvarNa and hema are equivalent words that refer to gold. The word hema is derived from the root hi - gatau, vRddhau ca - to go, topromote. or He Who has limbs that resemble gold in promoting His beauty. - "dhyeyas-sadA, savitR-maNDala madhyavartI nArAyaNa ... hiraNmaya vapuhdhRta sa'nkha cakrah....."
pon AnAi! Pozhil Ezhum kAval pUNDa pugazh AnAi! ..
a) He Who displayed His Divine Form to devaki in response to herprayers. b) He Who has beautiful limbs. c) He Who has a lovable Form that is pleasing to those who meditate on Him. Among the dictionary meanings for the term vara are: i) best, excellent, mostbeautiful; ii) boon; iii) a wish; etc. Different interpretations use thesedifferent meanings. having four arms, and the mystic mark of SrIvatsa on His chest, and startedpraising Him". One Who has beautiful limbs. He Who has a Form that is pleasing (lovable) to those who meditate on Him. Thus he gives the meaning "lovable" to the term vara. We have seen three nAma-s above in sequence, which all describe the beauty ofHis form: suvarNa-varNah, hemA'ngah, varA'ngah. SrI rAdhAkRshNa SAstri gives hisanubhavam of the subtle difference in the ideas conveyed by the three nAma-s.
varA'ngah - One Who has all the sAmudrikA lakshaNa-s brought together in oneplace, in His Form. The dharma cakram writer comments that even as beauty in human form tends toevoke kAmam, the beauty of the divine form evokes bhakti. The three nAma-s thatwe have just gone through, convey to us the beauty of the Divine Form of LordvishNu, that evokes bhakti in those who mediate on His Form. He Who is adorned with delightful armlets. b) He Who is besmeared with pleasing sandal. c) He Who provides us all with the means and ways to be happy. d) He Who has a'ngada as His pleasing devotee. The word candana is derived from the root cand - AhlAde dIptauca - to be glad, to shine. That which causes pleasure is candana - candyateanena, candayati vA yat, tat candanam iti (SrI satyadevo vAsishTha) - Thatthrough which happiness is attained, or that which is instrumental in bringinghappiness, is candana. The word a'ngada is derived as - a'ngam dayate, dAyati,dyati vA. The relevant roots are: de'ng - pAlane - to protect, to cherish (dayate);or daip - Sodhane to purify, to be purified (dAyati); or do - avakhanDane - tocut, to divide, to move (dyati). The term is used for the ornament worn on theupper part of the arm (keyUram). The armlets are ornaments of defense worn onthe upper arm to protect the shoulders from enemy swords. Thus we get themeaning "He Who is adorned with delightful armlets" for the nAma. "kaNgaL Sivandu periyavAi, vAyum Sivandu kanindu,..makara kuNDalattan.oruvan aDiyEn uLLAnE". kA'ncIguNa nUpurAdibhih atyanta sukha sparSaih divya gandhaih bhUshitam. "tayarathan peRRa marakata maNit taDattinaiyE". Marakata maNi has the characteristic that it will remove the fear from poisonouscreatures, because they won't even approach anywhere close to its location.Similarly, enemies won't even get close to where Lord rAma is. The word taDamrefers to a cool reservoir of water, which is liked and desired by everyone. b) SrI ananta kRshNa SAstri ues the meaning "sandal" to the termcandana, and gives the interpretation that He has this nAma because He isadorned with pleasing sandal on His body. c) SrI satyadevo vAsishTha uses the meaning "pleasing" to the termcandana as we indicated earlier, and the root a'ng - to go, and interprets thenAma candanA'ngadI as referring to "He Who gives the means or ways for allof us to be happy" - (AhlAdalarIm gatim yo dadAti). d) SrI satyasandha yatirAja gives an interpretation where he links the nAmato a'ngada, the son of vAli. He gives the meaning "pleasing" or"devout" to the term candana, and interprets the nAma as referring to"One Who has a'ngada as a pleasing devotee". The dharma cakram writer sees the nAma as revealing to us the guNa ofbhagavAn whereby we derive mental peace by the very meditation on the Form ofbhagavAn. a) The Slayer of the strong demons. b) The Destroyer of those who indulge in vain arguments and distract others from meditating on Him. c) The Destroyer of the bonds of yama. d) He Who leads the jIva-s to moksha by showing them the right path. e) He Who provides different ways for His creations to move around. f) He Who is accompanied by garuDa and vAyu when destroying the asura-s.
g) He Who ends the various paths that go from birth to birth. We have delved into the anubhavam of this nAma earlier (nAma 168 - Slokam 18), and we will see the nAma again in Slokam 99 - nAma 927). The term vIra is traditionally used to refer to the attribute of a person who is heroic and exhibits valor towards his enemies in war. Based on amara koSa vyAkhyAnam: viruddhAn rAti hanti iti vIrah (rA - dAne, chedane ca) - One who destroys his enemies; vIrayati iti vA vIrah (vIr - vikrAntau - to display valor) - He who displays valor. So the nAma ‘vIra-hA’ literally means "He Who destroys the vIra-s". Based on the attribute of bhagavAn described here, namely that He is One Who destroys ‘vIra-s’, some interpreters have given the meaning to the term ‘vIra” itself, with a negative connotation (instead of the meaning ‘brave’, they interpret the term as referring to ‘those who violate dharma’, based on the root Ir – gatau – to go, or, Ir – kshepe – to move, to throw, to cast off, to discard. In this interpretation, those who discard the path of dharma are being referred to as ‘vIra-s’, or those who go in the wrong path are called ‘vIra-s’ (see the interpretations of SrI vAsishTha and SrI kRshNa datta bhAradvAj below). To understand the interpretation of the nAma with the positive meaning ‘brave’ for ‘vIra’, we should remember that all vIra-s are not followers of dharma. In this nAma, bhagavAn's guNa of destroying the vIra-s who resort to a-dharma is what is addressed. SrI satyadevo vAsishTha elaborates that it is only where vishNu is that victory is, and it is not necessarily where a vIra is. Victory is where dharma is. A person who has the strength, but who tortures the innocent, is called an "aparAdhI" or one who has committed an aparAdham. It is these people that are destroyed by bhagavAn in the end without a trace. Grammatically, words such as vIra-hA kAma-hA, etc., signify a past action (one who has destroyed) - pANini sUtra 3.2.87). a) SrI BhaTTar gives examples of the "vIra-s" covered under this nAma: It is the likes of pUtanA, SakaTa, the twin arjuna trees, and such others who tried to kill child kRshNa deceitfully. (Note the references to pUtanA, SakaTAsuran, the twin maruda trees, bakAsuran, kuvalayApIdam, etc. He killed all these, and then just smiled with His bright teeth showing through the red lips in a mild artistic smile that is characteristic of Him whenever He achieves a feat). tiruma'ngai AzhvAr refers to Him as "the vIra beyond all vIra-s" - vem tirAl vIraril vIrar oppAr (periya tirumozhi 2.8.2). SrI vAsishTha gives the derivation - viruddha gatIn hanti iti vIra-hA. Along the same lines, SrI kRshNa datta bhArdvAj gives the interpretation: viSesheNa Irayanti kshipanti dharma mArgam iti vIrAh kamsa rAvaNa prabhRtayah; tAn vIrAn hanti iti vIra-hA - He destroys those that discard the path of dharma, such as kamsa, rAvaNa etc..
b) Another interpretation that SrI BhaTTar gives for the term ‘vIra-s’ in the context of this nAma are those that are proficient in words, but misuse their skill to give fallacious arguments and prevent people from meditating on Him. BhagavAn destroys them, and so also He is referred to as vIra-hA (sva-vedana vihantRRn haituka-vIrAn hatavAn iti vIra-hA). c) For the third instance of the nAma, SrI BhaTTar explains the nAma as referring to "One Who removed the strong bonds with yama for gajendra". SrI baladeva vidyA bhUshaN explains the nAma as: vIram vikrAntam graham hatavAn iti vIra-hA” – He Who destroyed the ferocious crocodile. BhagavAn removed the bonds of yama from gajendra by releasing him from the crocodile's jaws - mokshayAmAsa nagendram pASEbhyah SaraNAgatam (vishNu dharma 69). The nirukti author summarizes the vyAkhyAnam: vIram tad-bAdhakam mRtyum hatavAn vIra-hA matah. d) One of the interpretations that SrI Sa'nkara gives is that BhagavAn is called vIra-hA because He destroys the asura vIra-s (covered under a). In addition, he gives an alternate interpretation that bhagavAn has this nAma because He shows the right path to the samsArin-s and gives them salvation, by taking them away from following the various wrong paths - vividhAH samsAriNAm gatIh mukti-pradAnena hanti iti vIra-hA. SrI ananta kRshNa SAstry indicates the derviation of this interpretation as: “The Destroyer (hA) of various (vi-) wrong paths (Ira), by conferring salvation on the devotees”. e) In addition to the interpretation a), SrI satyadevo vAsishTha uses the roots Ir -gatau - to go, and hamm - gatau - to go, to give another interpretation: vividham Irati iti vIrah - referring to all the different creatures which move in different ways; tAnsca yo hanti - gamayati - He Who makes it possible for them to go, is vira-hA - sarveshAm bahudhA irANAm jantUnAm gamayitA vishNuh. f) One of the interpretations given by SrI satya sandha tIrtha is: vih = garuDah, Irah = vAyuh; tAbhyAm hanti gacchati iti vIra-hA - vishNu is called vIra-hA because He goes along with garuDa and vAyu in destroying the asura-s.
g) In one of the interpretations, SrI cinmAyananda takes the term vIra to mean "various or different paths or ways", (this is probably derived from the root Ir - gatau - to go), and gives the interpretation to the nAma as "He Who ends the passage from birth to birth". The dharma cakram writer observes that just as there are those who follow the path of a-dharma and are destroyed by BhagavAn, there are the internal enemies in each one us in the form of kAma, krodha, moha and lobha, which are also destroyed by Him when we devote ourselves to Him. The lesson to take from this nAma is that the chanting and meditation on the mantra derived from this nAma will result in His destroying these internal enemies in us, that obstruct us from realizing Him. b) He for Whom there is no equal. c) He Who destroyed the effect of the poison that was consumed by rudra duringthe churning of the Milk Ocean. The word vi-shamah is derived by the combination: vi + samah = vishamah -vigatah samo yasya iti vi-shamah - One Who is devoid of equals is vishamah. Whenthe prefix vi is combined with the word samah, the sa becomes sha according topANini sUtra 8.3.88 (ashTAdhyAyI) - su-vi-nir-durbhyah supi, sUti, samAh - The sof svap, sUti, and sama, is changed to sh after su, vi, nir, and dur. a) SrI bhaTTar's anubhavam is that His guNa of vi-samam reflects in Hisconflicting behavior in His treatment of the good vs. the bad. Hisinterpretation is that bhagavAn is "One with unpredictable and conflictingacts" - vi-samah, because He acts in different ways with different persons.He is very benevolent with His devotees, and He is fearsome and terrific withthose who are offenders of dharma. SrI v.v. rAmAnujan refers us to tiruvAimozhi 2.6.1, where nammAzhvArdescribes this guNa of bhagavAn: "vaikunthA maNi vaNNanE en pollAt tirukkuraLA .. Sei kundA varum tImai un aDiyArkkut tIrttu aSurarkkut tImaigaL SeikundA! "Sittirat tEr valavA! Tiruc-cakkarattAi!..ivai enna viDama'ngaLE!" He was the charioteer for arjuna in the mahAbhArata war. As arjuna's charioteer,He will either depress the whole chariot slightly or raise it slightly, suchthat the arrows of bhIshma aimed at arjuna will miss him, and the arrows ofarjuna meant of the enemies will hit their targets without fail. In the warbetween arjuna and jayadratha, He just wielded His cakra to interchange day andnight, so that jayadratha who was hiding till he thought the sun had set, couldbe eliminated by arjuna. These are just some instances of His "viDama'ngaL". - Because He is biased towards His devotees, He is called vi-samah. "You are the Father of this world, of all that moves and that does notmove. You are its Teacher and the One most worthy of reverence. There is noneequal to You. How then can there be another greater than You in the threeworlds, O Being of matchless greatness?" "You are a mA-mAyan without a peer or a superior". "The purAna purusha, vishNu, is distinct from everyone else, and isdistinct. Consistent with this guNa of His, He has also created everything elsesuch that nothing is same as another in His creation. This guNa is spread notonly in species of different kinds, but also in members of the same kind". c) SrI satya sandha yatirAja gives the interpretation that He has the nAmavishamah because He nullified the effect of the poison that was consumed byrudra during the churning of the Milk Ocean (visham rdura pItam mInAti hantisva-nAma-smaraNena iti vish-mah. The root mI - himsAyAm - to kill, to lesson, tochange, to be lost is used in this interpretation). that bhagavAn is unique and without anyone to compare to Him - vi-samah. a) He is hRshIkeSan - One Who is unexcelled in His control of His indriya-s, andeven more so, He is the sole Controller of all our indriya-s.
b) He is keSavan, KeSi nishUdanan, madhu sUdanan, etc. In other words, there isno one comparable to Him in assisting the deva-s when they are harassed by theasura-s, and in destroying the asura-s.
c) He is govindan, since there is no one comparable to Him in knowing the natureof the jIva-s.
d) He is janArdanan; there is no one as determined and powerful as He is inchastising the wicked people. e) He is vishNu; He pervades everything and He is everywhere. Without Himnothing exists and functions. f) He is yogISa and yogavidAm netA - The best among the yogi-s and the Leader ofall those who follow the path of yoga. g) He is bhagavAn, who is unique in His shad-guNya paripUrNattvam - thequalities of j~nAna, Sakti, bala, aiSvarya, vIrya, and tejas. h) He is acyuta, Who neither slips from His vow, nor lets His devotees slip awayfrom their goal. These are just a few instances that bring out His vi-samattvam,and so He is known as vishamah. a) He Who is devoid of defects when He takes births as one of us. c) He Who goes everywhere, or is present everywhere. d) He Who cleans out everything at the time of pralaya. e) He Who is not accessible when we seek Him through our senses. The word SUnyam means empty, void, etc. The nAma is interpreted by differentvyAkhyAna kartA-s in terms of His being devoid of defects, His destroyingeverything completely at the time of pralaya, His ridding His enemies completelywithout trace, etc. tuyaram il SIrk kaNNan mAyan pugazh tuRRa yAn Or tunbam ilanE. BhagavAn is without any trace of defect, and this is well accepted. But Hetakes birth among the grief-stricken human beings. Even so, He continues to haveall His parattvam intact in His incarnations, and so He is without any defect.He takes these births so that He is accessible to the people. He continues totorture His enemies through His weapons etc., and He continues to torture Hisdevotees because of even the minutest separation from Him. But for nammAzhvArthere is no tuyaram in this world because he is constantly having the anubhavamof His thought. 6) AtmIya raksha, vipaksha vinASanArthaih (They are assumed for the protectionof His devotees, and for the destruction of their enemies, and not for theexpiation of the karma accumulated in previous countless births as in our case).It is clear that bhagavAn is a Big Zero when it comes of to any form of defecteven when He is born among us humans! SrI kRshNa datta bhAradvAj gives the interpretation that the nAma signifiesthat bhagavAn is completely devoid of anay guNa-s associated with prakRti -prAkRta guNa virahitatvAt SUnyah, which is item 4 in svAmi deSika's list above. b) SrI Sa'nkara's interpretation is a reflection of his advaita philosophy -He is called SUnyah because He is devoid of any attributes - sarva viSesharahitatvAt SUnyavat SUnyah. c) SrI satyadevo vAsishTha uses the root Sun - gatau - to go, and interpretsthe nAma as referring to "One Who goes everywhere, or is everywhere" (SunatiprApto bhavati sarvatra iti SUnyo vishNuh). He points out that kham - the wordfor sky, also means "void" or "a cipher". It is becausethere is a void that a motion or movement from another place to this void ispossible, and thus void leads to motion, and motion leads to void. He points outthe importance of SUnya by reminding us how the number "1" undergoes aten-fold increase in value by the placement of just a SUnyam next to it in thenumber system. d) SrI satyasandha yatirAja gives the interpretation that He is SUnyahbecause He clears out everything in this universe with nothing left, at the timeof pralaya - pralaya kAle sarva padArtha SUnyatvAt SUnyah. e) The dharma cakram writer gives yet another anubhavam: bhagavAn is calledSUnyah because He is not accessible to our senses, no matter how much we try. Weare used to believing that something exists only if we can relate to it throughour senses. He is not accessible to the senses, and so He is SUnyah. a) He Who sprinkles the world with prosperity b) He Who is desirous of thebutter in the gopis' houses. c) He from Whom all desires have flown away. d) HeWho enjoys the offering of ghee in the homa etc. The two parts that make up this nAma are ghRtam and ASIh. There are severalmeanings for the word ghRtam - secanam, ksharaNam, dIpanam vA ghRtam -sprinkling, flowing, or shining. ghRtam also refers to ghee or butter. The wordASIh is derived from the root A'ng - SAsu - icchAyAm - to expect, to bless. Thedifferent combinations result in the different interpretations. a) SrI bhaTTar derives his interpretation using the meaning ghR - secane - tosprinkle, to cover. SrI bhaTTar's vyAkhyAnam is - ghRtam - secanam, sva-guNaihjagat ApyAyanam - He makes the world prosperous by means of His benevolentqualities. (ghRte ASIh kAmo yasya sa ghRtASIh). He of non-existent requests is ghRtASIh. SrI rAdhAkRshNa SAstri paints a picture of this guNa by pointing out that"the qualities of desiring something, seeking someone's grace to get it,receiving it from someone, etc., which are common sequences for many of us inday-to-day life, have melted away like ghee, and dripped off or oozed out fromHim, and so He is devoid of all these qualities of need, want, etc". d) SrI satyadevo vAsishTha gives the interpretations that He is ghRtASIhbecause He desires or enjoys the offerings of ghRtam or ghee in the fireofferings; or, He is ghRtASIh because He likes the offering in the form of alighted dIpam. a) He Who is unshakable against His enemies. b) He Who is immutable in Hisnature, power, wisdom, etc. c) He Who does not move anywhere, because He iseverywhere already. The root from which the nAma is derived is cal - kampane - to stir, toshake. That which does not move, or He Who is firm in His conviction and action, arecalled a-calah. He is called a-calah because He is not stirred by the evil-minded duryodhana andothers. He is Immutable, or a-calah, because He undergoes no change in His nature,power, wisdom or any other attributes. The reader is again referred to the article thathad been posted earlier, comparing the approaches of SrI Sa'nkara dn SrI BhaTTarto the vyAkhyAna of SrI vishNu sahasra nAmam. The difference we see in theinterpretation of the current nAma is another illustration of this difference. It is eternal, all-pervading, stable, immovable, and primeval". SrI satyadevo vAsishTha observes that bhagavAn Who is a-calah, has alsoinculcated in all His creations, the principle of a-calattvam in some form.Thus, for instance, the tree or plant that comes out of a given seed is only ofthe same type as the seed, and not of a different type. This dharma is notviolated ever. When a fire shoots out, it is always directed in an upwarddirection, and not in a downward direction. Thus, even those that are moving andactive, are bound by His principle of a-calattvam. The dharma cakram writer gives a real-world analogy to illustrate theimportance of this nAma. A small wind is able to move and shake small plants; abigger cyclone is able to uproot even big trees; however, a mountain is notmoved by any of these. Similarly, people who are involved and entangled inworldly joys and sorrows are shaken up and tossed around emotionally; evenarjuna got totally confused and disheartened when he entered the battlefield. Itis very rare indeed to find human beings who are not tossed around, becausetheir indriya-s control them. But he who controls his manas and indriya-s isfirm in his resolve, and he is not tossed around or shaken by happenings aroundhim. His mind becomes a-cala manas. The peace that comes out of this dispositionis the true peace that we should aim for. a) He Who swerves. b) He Who moves (in the form of vAyu etc.). c) He Whorushed out of SrI vaikunTham at the cry for help from gajendra. d) He Who isfull of leelA-s.
We just saw in the previous nAma that bhagavAn is a-calah. Now we see that Heis also calah, He Who swerves. His a-cala guNam or firmness was towards Hisenemies; his cala guNam is reserved for His devotees. SrI bhaTTar gives the well-known instance of His carrying arms againstbhIshma after making a promise earlier that He will never take to arms in themahA bhArata war. Thus, He swerved from His word, and so He was a calah in thiscase. A couple of reasons are given for His breaking His own promise. One wasthat He wanted to save His dear devotee, arjuna, from the wrath of bhIshma, andso decided to go with His cakra against bhIshma to protect arjuna. The secondreason given is that bhIshma, who was a great devotee of kRshNa, had taken anoath in front of kRshNa the previous evening that he will fight so ferociouslythe next day as to make kRshNa break His promise and take to arms; what was atstake was the word of His devotee bhIshma, and kRshNa had to protect the word ofHis devotee even if it meant that He had to break His own promise. Making Hisdevotee's word come true was more important for Him than to keep His ownpromise. So He took to arms, and thus became a calah - One Who swerves for Hisdevotee. Another instance was His cheating jayadratha by converting day intonight. The real truth to be understood in the above instances that He is the Onewho establishes what is right and what is wrong, and so by definition, what Hedecides is Justice. vAyu rUpeNa calati iti calah. c) SrI ananta kRshNa SAstry has added an interpretation that He is calledacalah because He rushed out of SrI vaikunTham to help the elephant-kinggajendra when he cried out for help.